I have heard nice things about hairdresser George Northwood ( tall, skinny, slightly reserved but welcoming ) and love what he does to Rosie Huntington-Whiteley and Alexa Chung‘s but what I didn’t know is that you can also have a Perricone facial in his salon as well and you can’t ask for better hands that a facialist with over 20 years of experience Tine Hagelquist, who has previously worked for many brands, including Ole Henriksen, Dr Sebagh and NuBo. George’s salon is a short walk from the Oxford Street tube station and while it does have a slightly industrial, cool and modern look it also feels surprisingly cosy, with bright colourful lights on brick walls, a relaxation area to get a Roots & Bulbs juice created especially for the salon and comfortable hairdressing stations dotted at a comfortable distance from each other, both on the ground level, as well as downstairs. 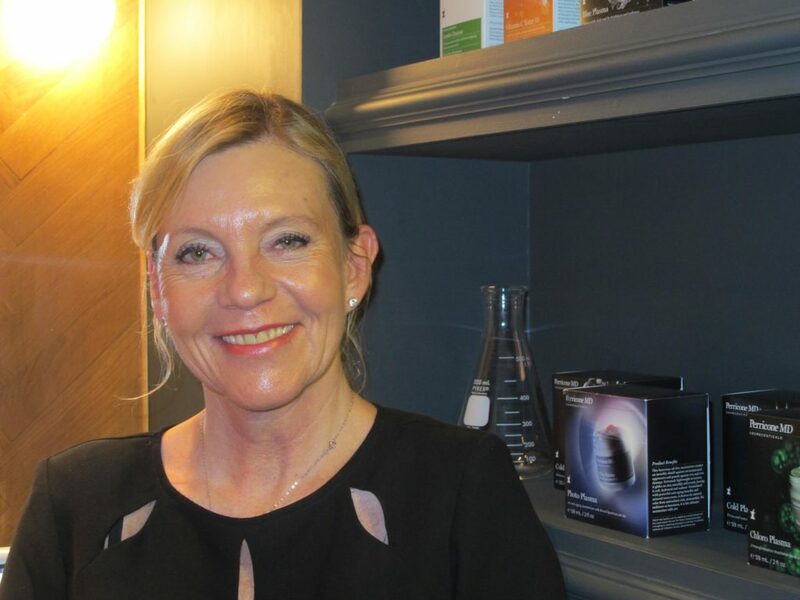 Tine has been using Perricone products since 1997 and has remained loyal to the brand since then, which is quite telling in our fast-paced world when women seem to be on the lookout for the latest product launch, rather than using skincare products that will offer their skin consistent results. The treatment room itself is quite small but Tine manages to make it look professional & very welcoming. I was surprised to see a hairdressing chair there, as I have never had a facial in one, but it turned out to be a comfortable and sleep inducing cocoon – where there is a will, there is a way to create unusual experiences. Tine started with putting a hairband just above my forehead and switching a chilling vibes CD. With me laying comfortably on the chair, she started with massaging my shoulders and neckline and then the face with the new Perricone cleanser called Blue Plasma. You don’t need water to use it, just spread it all over with a saturated cotton pad. It removes make-up effortlessly and without drying the skin. It is an intelligent hybrid of a facial serum and peel which helps to resurface your skin while acting as a triple multi-tasker: it peels away dead skin cells, micro-purifies your pores and fuses your skin with moisture. Tine followed it up with applying a Pore Minimiser serum which helps to clear the surface impurities on the skin without stripping it of natural oils. On top of it Tine layered the Blue Plasma Peel which is in effect a night treatment that you can use every night to gently exfoliate your skin. It imparts radiance on your skin in part due to copper being one of the formula ingredients. At that stage, accompanied but strong massage I started to struggle not to fall asleep, and that was at 11am in the morning. Cold Plasma is one of Perricone MD best-sellers as it’s delivery system targets multiple signs of ageing, including wrinkles, dryness, discolouration & minimising enlarged pores. On top of it Tine layered the Chia Serum ( chia seeds are not just for eating then !). Chia oil boasts a multitude of benefits and is considered one of the highest plant sources of Omega 3 Fatty Acids. This serum also combines fat-soluble vitamins which help to protect the skin against moisture loss and negative impact of the environmental aggressors. Tine gave me the tip that you can apply this serum on top of your make up during the day to help revive your skin during the day. The facial at that stage consisted of the firm but equally relaxing massage of the face, neck and décolleté. As part of her technique Tine gently pinches the skin on your decollete in order to speed up the lymphatic drainage process, leading to plumper and smoother skin. She also does it on the sides of the neck to tighten and firm it. Like brain our face has two sides and Tine worked on each side in turn, giving me a lifting and draining massage with her strong fingers and including the chin, eyelids ( one of the most soothing parts of the facial ) and forehead. When working on the eye area Tine applies Acyl-Gluttathione Eye Lid Serum ( as the name suggests it improves the depth of creases making them appear less engrained, minimises wrinkles – you can also apply it around the lips to improve feathery lines or to the forehead to improve the appearance of laughter, frown and worry lines ), followed by Blue Plasma Orbital ( a night treatment like Blue Plasma for the face which gently exfoliated the delicate skin and also prevents formation of milia, which when they appear on the face, would need to be removed by a trained facialist or dermatologist). As part of my Perricone MD Signature facial I also got to experience the recently launched Chloro Plasma which is an anti-ageing treatment mask that has a gel-to-clay texture with the slow releasing burst of Chlorophyll which brightens the skin beautifully after five minutes. After removing the mask Tine applies a Pore Minimizer and Formula 15 which was added to the line of products to commemorate Dr. Perricone’s 15th brand anniversary ( it targets the improvement in the appearance of the length, width and depth of wrinkles while refining skin’s texture at the same time ). If that wasn’t enough of a treat for the skin, Tine applied Face Finishing Moisturiser with DMAE mixed with Vitamin C Ester 15 to make my complexion dewy and bright and followed it up with Hypoallergenic Firming Eye Cream with Tocotriniols and Cold Plasma Sub-D on the mandibular area ( located below the jawline ) that helps address the loss of elasticity along the jawline, chin and neck. This cream targets the muscles that drop with age and Tine told me that clinical results were quite impressive. By the end of the facial my mind was clear and focussed, my complexion was radiant and plump, so I could have easily walked out of the salon without a scrap of make-up but I did ask Tine to apply a light layer of No Foundation Foundation. Tine told me to get up gently but not before making me stretch my arms and legs away from my body ( a very good habit to get into first thing in the morning, when you wake up – you don’t even need to open your eyes first ). For the rest of the day my face looked just perfect – even complexion, plump, smooth – as if I just came back from a long weekend in the spa. I was almost reluctant to wash my face in the evening and the next day my skin felt so smooth and well-moisturised I only applied the serum and was ready to face the day ahead. The benefit of the facial is not just the potency and efficacy of Perricone products but the fantastically effective massage technique that Tine uses. It really tones the muscles, speeds up regeneration process in the skin and reminds you hope good it is to do twice daily, even for five minutes, when you apply your cleanser, serum or moisturiser to your face – it is one of the most trusted tools in your daily arsenal of age proofing your skin, whatever your age. Since I had a facial they are no longer available in the privacy of George Northwood salon but you can have the experience of Perricone MD facial with Tine on April 12-18 in Harrods. Call Perricone MD counter in White Hall to book: tel. 0207 7301234.